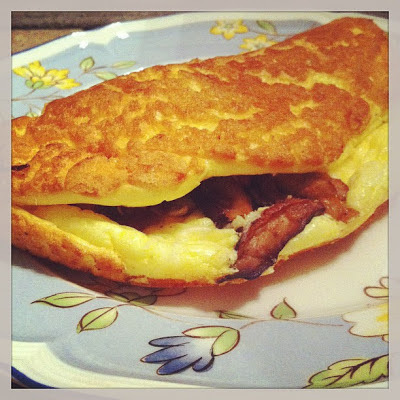 Omelettes are a quick meal when there are no leftovers and little time to cook. They are tasty and versatile, making a great "go-to" meal. Legend says that Napoleon Bonaparte and his army traveled through southern France and decided to rest at an inn near Bessières. In the morning, the innkeeper prepared an omelette for breakfast. After feasting on it, Napoleon ordered the townspeople to gather all of the eggs in the village and to prepare a huge omelette for his army for the next morning. To this day, there is a huge annual Easter omelette prepared in Bessières. Speaking of random omelette trivia, the world's most expensive omelette is available at the Le Park Meridian Hotel in Manhattan. It is $1,000 and full of caviar and lobster. Now, there are a few different types of omelettes. There is the traditional French roll with a pure yellow surface and only a small amount of filling in the center. Then, you have the diner style omelette that is browned and stuffed to the brim with cheese and other fillings and folded into a half moon. Next, the egg white omelette is a much lighter omelette and cooked only from egg whites. And, then you have the fluffy omelette. This fluffy omelette has a souffle-like texture. The egg yolks and whites are beaten separately, which helps produce a light, airy omelet. From Cook's Illustrated, I learned that the egg whites build structure in an omelette, but that structure is weakened by the fat from the yolks. By whipping the whites with cream of tartar, more stability is added. Melted butter is mixed into the yolks, and this helps to tenderize the omelette and richen the flavor of the yokes. I added a mushroom filling into the omelet with some white cheddar cheese. This was by far the most-impressive--and delicious--omelette that I have made! For the filling: Heat oil in a 10-inch nonstick skillet over medium-high heat until shimmering. Add the shallot, and cook until softened and starting to brown (about 3 minutes). Add the mushrooms, and reason with salt and pepper to taste. Cook until the liquid has evaporated and the mushrooms begin to brown, about 6 to 8 minutes. Transfer to a bowl and stir in the vinegar. For the omelet: Adjust the oven rack to the middle position, and preheat the oven to 375ºF. Whisk egg yolks, melted butter, and salt together in a bowl. In the bowl of a stand mixer, add the egg whites and sprinkle the cream of tartar over the surface. Using the whisk attachment, whip the egg whites on medium-low speed for about 2 minutes, or until foamy. Increase the speed to medium-high and continue to whip until stiff peaks begin to form, about 2 to 3 minutes. Next, fold the egg yolk mixture into the egg whites until no white streaks remain. Heat the remaining tablespoon of butter in a 12-inch oven safe nonstick skillet over medium-high heat. Swirl the butter to coat the bottom of the pan. Once the butter foams, add the egg mixture, and spread it into an even layer with spatula. Remove the pan from the heat. Sprinkle the filling and shredded cheese over the top of the omelet. Transfer the pan to the oven and cook until the center of the omelet springs back when lightly pressed, about 4 to 5 minutes. After the pan is removed from the oven, run a spatula around the edges of the omelet to loosen, shaking gently to release. Slide the omelet onto a cutting board and let is stand for about 30 seconds. Using the spatula, fold the omelet in half. Cut the omelet in half crosswise and serve immediately. I love omelette, any time of the day! Yours look just wonderful and so fluffy! I love mushrooms and gotta give this a try soon. Have a wonderful weekend.